Back to Childhood Days ! You must be a member of the Cairo Outdoor Activities Group to attend this activity. Would you like to join this group? The remarkable thing about Egypt that we have so many National holidays . So let’s have fun in our holiday at next Thursday! If you are missing childhood days and playing like kids , fighting, hanging and jumping! 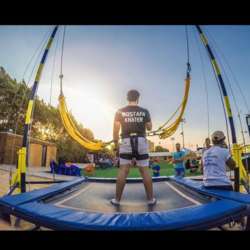 Dragon park is the right place to do that, it’s new place that manage adults to play like kids via so many activities like Trampoline park, high rope, zip line, bunjee and sumo fight. So let’s meet up and get rid of work stress and routine life ! Prices are attached as photo in the Album here . Please please please : i want to know the exact number of attendees to inform the venue so if you aren’t going don’t press the button, it’s better if you confirm by messaging me here or on WhatsApp .